Calacatta Extra by Atlas Plan is characterized by a compact, luminous white ground, with striking gray veining and gold reflections. A marble effect that goes perfectly with both classic and modern interiors, also making it easy to pair with any other materials and effects. 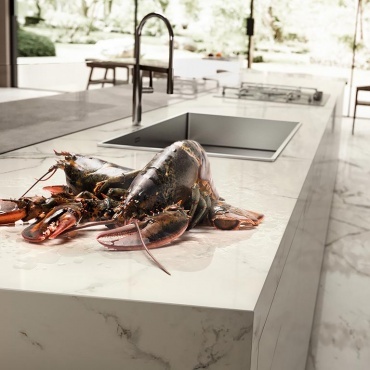 The white colour and subtle veining give the porcelain stoneware slab an elegant, refined character. The 162x324 cm size and 6 mm thickness also allow seamless use across cabinet and drawer fronts, for a visually uniform result. Calacatta Extra is available in natural satin and shiny lapped finishes and comes in 3 thicknesses: 6, 12, 20 mm. Thanks to Calacatta Extra Bookmatch, visual continuity can be achieved across: kitchen tables, islands, worktops, backsplashes, drawers, doors, bathroom vanity units, countertops and bar and restaurant counters. Calacatta Extra Habitat: Calacatta Extra slabs with lapped lux finish are paired with Concrete Grey slabs by Atlas Plan and, for floors, Boost Grey by Atlas Concorde. These are complemented by other types of materials and carefully selected objects designed to make every single space unique and harmonious.